It looks like comedian Kimura Yuichi (46) might be gearing up for marriage number four, according to a weekly magazine. Today’s issue of women’s mag “Josei Seven” says Kimuni is in a relationship with fledgling actress Nishikata Ryo (28). She is currently appearing in the movie “Nisesatsu,” which opened on April 11 and is the directorial debut for Kimura. After the official launch event last week, the cast and staff went out to celebrate. Nishikata and Kimura were later spotted returning to his Tokyo apartment. He left for work early the next morning, while she was in and out of the apartment during the day. Of course it’s only three years since he got hitched to actress Henmi Emiri (32), a marriage that lasted all of two years. 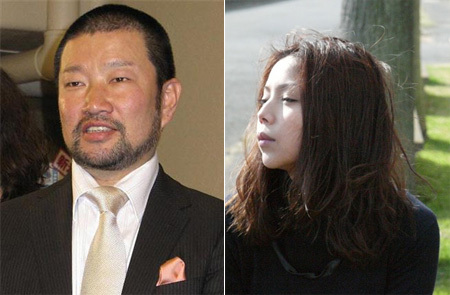 They split in April last year, leaving Kimura with three divorces under his belt. The new movie is also the debut for Nishikata as an actress. She formerly worked as a plasterer and broke into showbiz as a regular on the Akashiya Sanma-hosted variety show “Koi no Karasawagi” in 2002-03. She then switched to modeling and appeared in several TV commercials and music videos before auditioning for the movie role last year.